Women are everywhere, women are nowhere. Humans have to be made, bodies have to be remade. Rituals are the key to those acts of person-making. How I wish, reading this marvelous piece of ethnography, that we had anything of the same quality for the production of boys and girls in contemporary Europe. Gender relations, initiation rituals, and their comparative implications have intrigued anthropologists of Melanesia for many decades. Through a rigorous and finely-crafted case study of the Ankave, Bonnemère’s newly translated book expands our awareness of these issues and reaches path-breaking insights that have powerful ramifications for our relational understanding of gender and of social life generally. Acting for others is a book to stir the anthropological imagination. 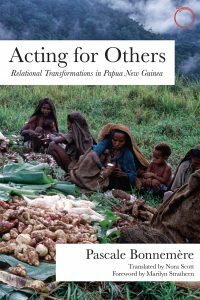 It breathes new life into debates over relationality and agency, both through a vivacious and lucid style and through the considerable assistance of the Ankave-Anga of Papua New Guinea. These people furnish Bonnemère with a beautifully orchestrated demonstration of just what is lost in overlooking women’s participation in social processes. And for those for whom ‘gender’ seems a restrictive rather than expansive category, we may expand that to what we take from the ethnographic record as significant about kinship, regeneration, and the states of being that people see all around themselves. Bonnemère’s new book is a leap forward from earlier anthropological concerns not just with what it is that rituals make when they seem to be making gender, but also with how they do so. Chapter Twelve: A few other relational figures?